This cabbage makes a delicious side dish for just about any meal. The cabbage is cut into wedges, cooked, and then served with a simple cheddar cheese sauce. 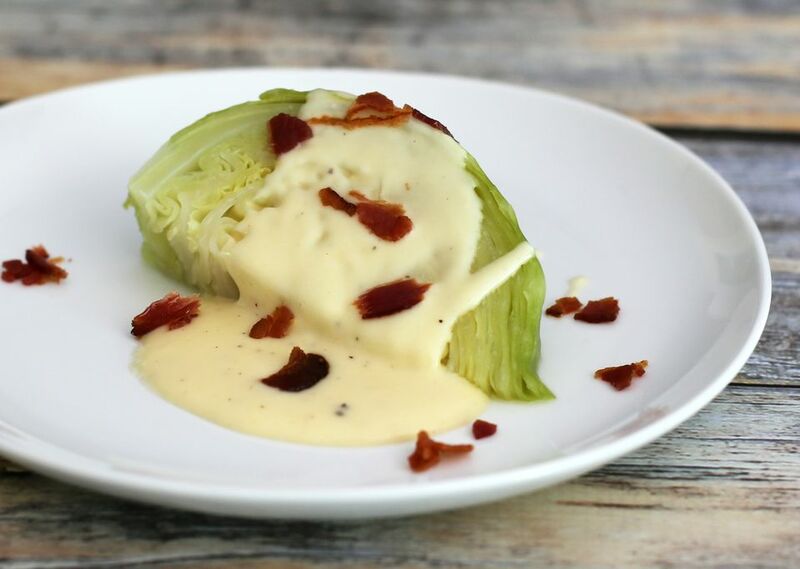 Crumbled crisply cooked bacon makes the perfect garnish for the cabbage. To give the cheese some smoky flavor, replace a tablespoon or two of the butter with bacon drippings. The dish is good with or without the bacon. Feel free to finish it with a sprinkling of paprika for color and flavor. Or mince some leftover browned ham and sprinkle it over the wedges. Carraway seeds, parsley, poppy seeds, and nutmeg go particularly well with cabbage. Cabbage is an excellent side dish to serve along with corned beef, kielbasa, or browned sausage (smoked or fresh ground) or ham. It also makes a yummy side dish to go with pork chops or a pork roast. Cabbage is a tasty side to serve with chicken as well. Add mashed potatoes, baked potatoes, or buttered noodles for a seriously delicious meal. Arrange the bacon in a large skillet; place the skillet over medium-low heat. Cook the bacon, turning frequently, until crisp and well-browned on both sides. Remove the bacon to paper towels to drain and set aside. Cut the cabbage into wedges and arrange the wedges in a large saucepan. Add a small amount of salted water and put the pan over medium heat. Cover the pan and cook the cabbage until tender, or for about 10 minutes. Meanwhile, melt the butter (or part bacon drippings) in a saucepan over medium heat. Stir in flour and dry mustard; stir to blend well. Cook, stirring, for 1 minute. Gradually add the milk to the roux while stirring constantly. Continue to cook, stirring, until sauce is thickened and smooth; add salt and pepper to taste. Add cheese to the sauce mixture; heat until melted. Crumble the reserved bacon and sprinkle it over the cabbage wedges. What Is Kohlrabi and How Is it Used?